The Similan Islands have a reputation, even among the many Thai islands, as one of the world's top scuba diving sites. The intense blue waters are framed by white coral sand beaches, and are home to intricate coral reefs and rock formations. The most famous dive site in the Similan Islands is Richelieu Rock, where whale sharks are commonly spotted. The Similan archipelago consists of nine islands: Ko Bon, Ko Bayu, Ko Similan, Ko Payu, Ko Miang, Ko Payan, Ko Payang, and Ko Huyong. Not all are open to visitors, and all are virtually uninhabited. 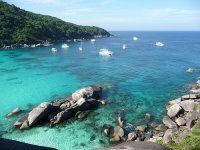 Many charters offer day trips to the Similan Islands from Phuket and Phang Nga, but there are limited accommodation opportunities as well. Note that the park is closed from May 1st to November 1st each year, and it is illegal to visit during this period; guests who do so put their lives at risk as there are is no emergency support.